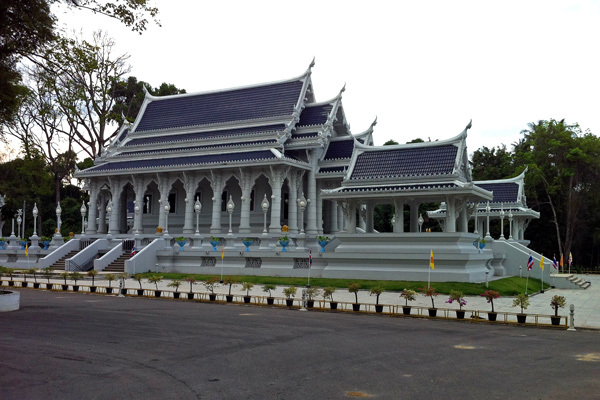 Wat Kaewkorawaram – or simply Wat Kaew in short – is a temple in the center of Krabi Town. 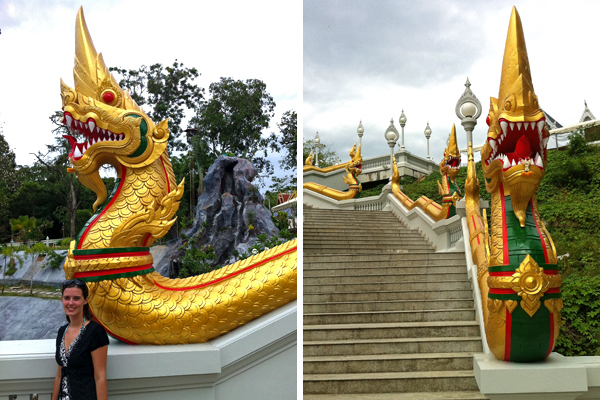 While not as big as Tiger Cave Temple outside the city and with only a fraction of the steps to climb, it is definitely worth a visit and a great activity for rainy weather. 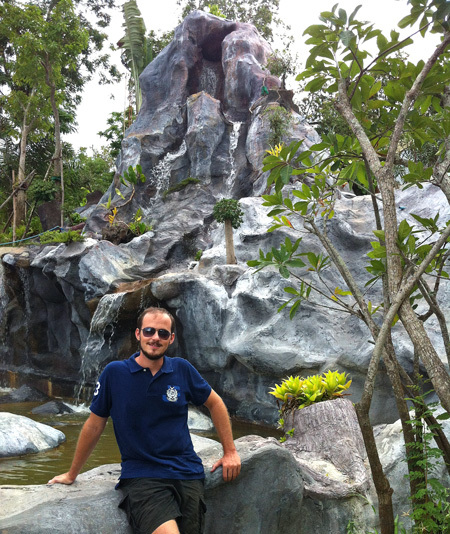 In our experiences afternoons in Southern Thailand have a higher tendency for rain. So instead of spending that time in your room watching movies, go explore this temple site in the middle of town. Probably not during a torrential downpour, but a cloudy, wet afternoon that can’t be spent at the beach offers itself perfectly. Walking through town – on the same street as the mall (Vogue Department Store) – it is this wide entrance way with golden dragon stairs that will catch your attention first. At night time you will even see young boys practicing their skate-boarding skills here. 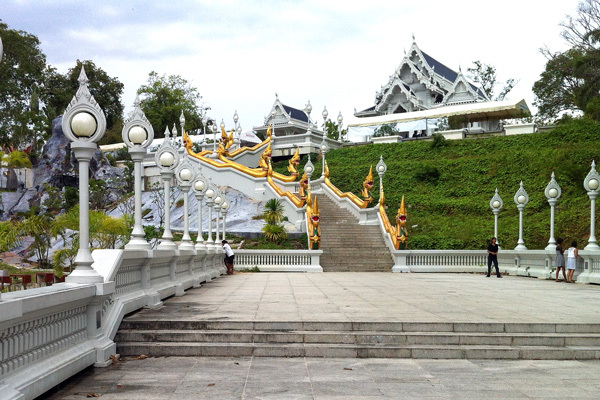 On top of the stairs you will find this large white temple complex with blue roofs. It is very relaxed and laid-back around here. 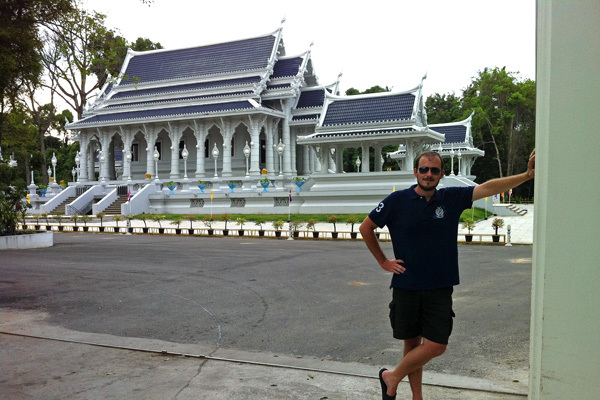 We have never seen many people here – be it Thais or tourists. 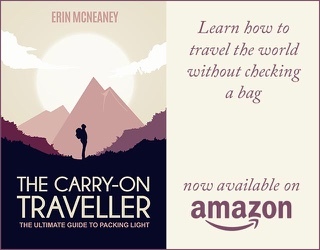 And no need to fret, if you forgot to put on long pants. We have seen even locals who come to bring offerings with shorts. Be respectful – and compliant if someone holds you back from going inside, but we’ve actually never seen anyone around acting authoritatively. 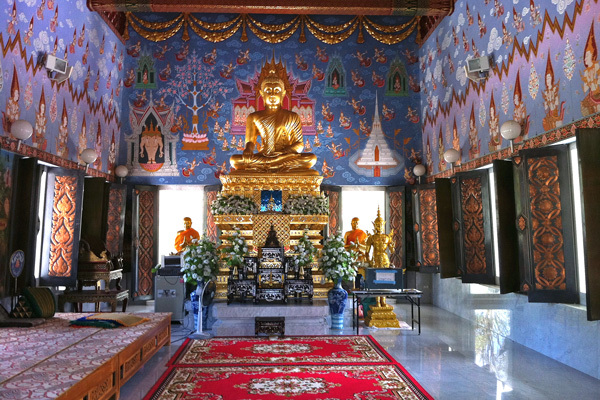 The inside is much brighter and more cheerful than most temples we have seen in Northern Thailand. 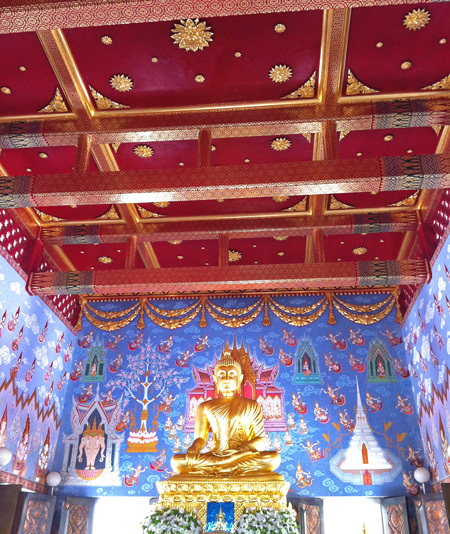 There is a big golden Buddha statue in a light blue room with red ceiling and open windows on all sides. On one side of the stairs there is some sort of a park with pathways leading by an artificial waterfall, elephant statues and a bridge over a pond. 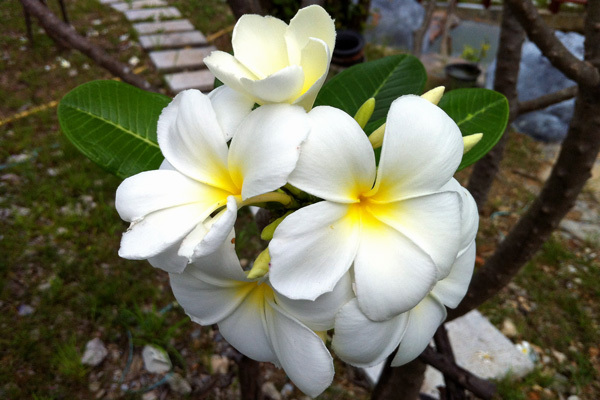 Plenty of pretty, flowering Frangipani trees around. 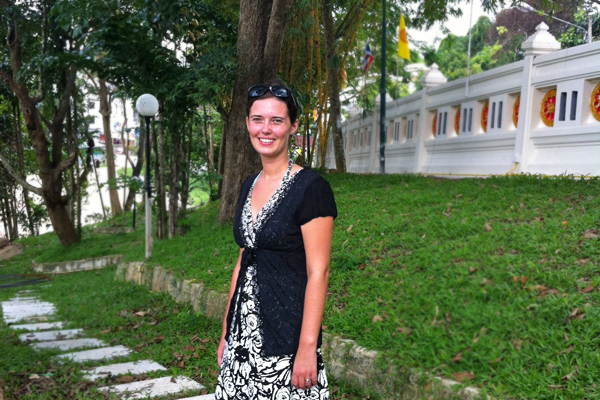 Walking around the temple area, we noticed a variety of animals that made the temple grounds their home. 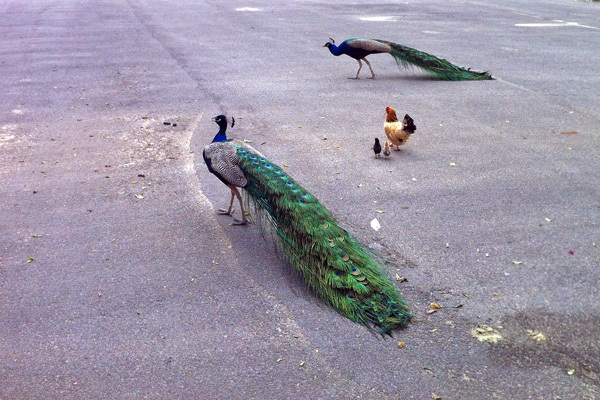 There were cats and dogs and chickens with little chicks, but most impressive were two beautiful peacocks who were strutting around majestically. 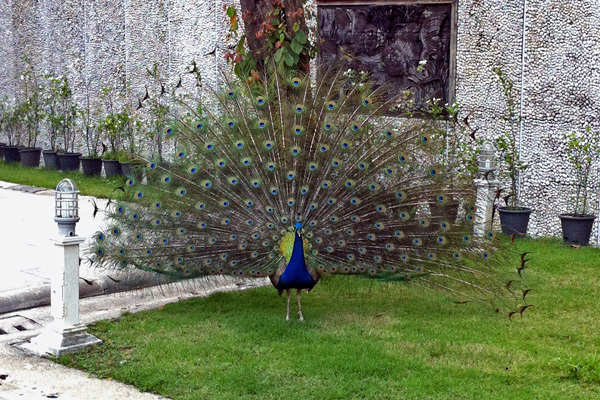 One of these even decided to show us his colorful plumage in all its splendor. What a spectacular sight! 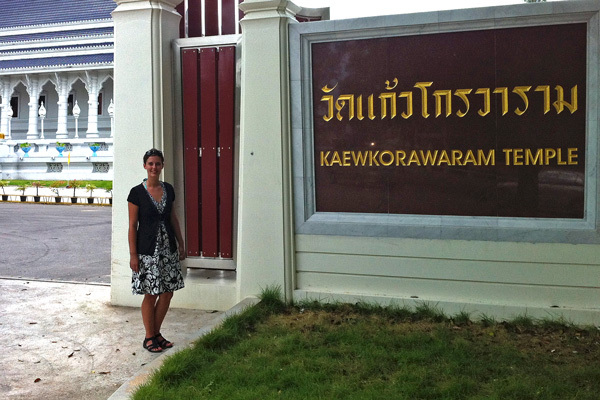 The temple has a second entrance (or exit) were you can actually read the full name in its length on a sign. If you leave the grounds from this side, walk further up the street (instead of going down and back to the town), and you can stroll along an art walk created only last year (2012). Many local artists painted a stretch of wall with sites and scenes of Krabi and every day local life here.